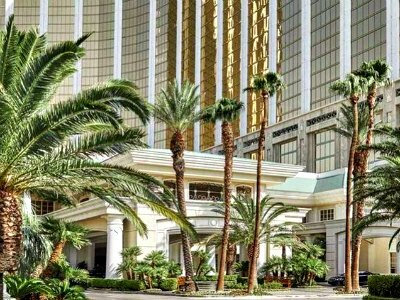 Here are the top ten romantic hotels in Las Vegas. There are numerous selections that are fantastic whether you want to be on the Strip or a few miles away. 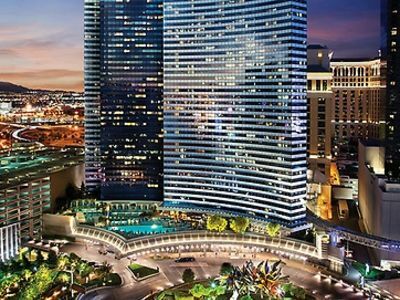 Couples looking for a non-gaming romantic hotel can try the Four Seasons and the Vdara Hotel and Spa sports large all-suites with views of the Bellagio Fountains. A little distance away from the Strip, couples will be thrilled with the amenities at Green Valley Resort and Casino, the natural scenery of Red Rock Canyon at Red Rock Casino Resort and Spa. The Wynn, Mirage as well as Palms Place bring out the best in luxury along the Strip with great access to world-class events. Couples looking for a European adventure should stay at the Venetian or Caesars Palace where Italian and Romanesque style vacations come true. 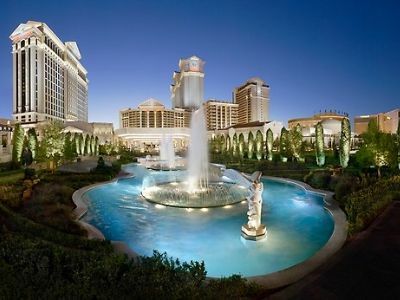 When in Las Vegas you can vacation like the romans at Caesars Palace which is an ideal romantic hotel in Las Vegas for couples looking for plush accommodations along with plenty of exciting onsite amenities. Located along the Strip, Caesars Palace features everything a romantic couple wants while they are on vacation like a superb spa, tasty cuisine and plenty of entertainment. The resort has an exquisite Roman architectural style with more than 4,300 rooms and suites that range in size from 350 to over 1,500 square feet which have been recently refurbished with an elegant interior. Caesars Palace has a gorgeous spa to help you and your loved one relax with plenty of treatments, saunas, plunge pools and steam rooms set in a Romanesque style. Dining at the resort includes specialty restaurants from Giada De Laurentiis, Restaurant Guy Savoy prepares French dishes, Mesa Grill by Bobby Flay serves up Southwestern fare and Nobu brings tasty flavors to the table. A great place for couples to walk within this romantic Las Vegas hotel is the 4.5-acre Garden of the Gods which resembles a Roman garden with numerous pools and spa tubs. Nightly entertainment at the Colosseum includes classic Vegas stars like Celine Dion, Gwen Stefani as well as Wayne Newton and couples will love the adult themed show called Absinthe. The Vdara Hotel and Spa is an ideal all-suite romantic hotel in Las Vegas for couples seeking spacious upscale suites, plenty of onsite amenities and lots of personalized services. Located in the CityCenter Complex one block away from the Strip, Vdara Hotel and Spa is a non-gaming hotel that packs an exciting punch for couples looking for romance. The all-suite accommodations are spectacular with plenty of living space, upscale furnishings, soaking tubs, kitchens and many of the rooms boast a view of the Bellagio Fountains from floor to ceiling windows. The ESPA at Vdara is the perfect spot for couples to enjoy an afternoon while replenishing their bodies after a hard night on the town of fun. The rooftop swimming pool is fabulous with gorgeous views of the Strip and plenty of daybeds as well as cabanas for couples. Entertainment at the hotel is non-stop with close proximity to many of the hottest venues such as The Park Theater and T-Mobile Arena. Dining at this romantic Las Vegas hotel is superb with numerous choices like Jean-Georges Vongerichten’s Steakhouse, Bardot Brasserie by Michael Mina serves up innovative French dishes and Julian Serrano Tapas brings the taste of Spain to the table. Couples looking for a romantic hotel in Las Vegas that offers tranquility, incredible scenery and upscale amenities onsite will be pleased when they stay at the Red Rock Casino Resort and Spa. 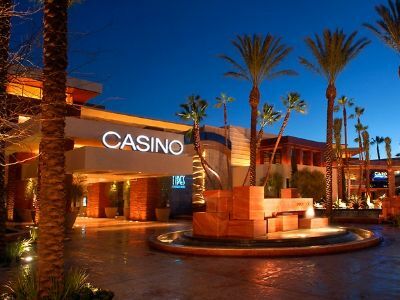 Located 10 miles from the Strip adjacent to Red Rock Canyon National Recreational Area, the Red Rock Casino Resort and Spa is situated on 70 sprawling acres of lush gardens. The resort sports a unique mid-century modern architectural style with spacious rooms as well as suites that feature a sleek contemporary decor, soaking tubs and floor to ceiling windows that boast views of the Red Rock Canyon, Strip and Mojave Desert. The Spa Red Rock is an ideal spot to help couples prepare for a big night on the town with several unique treatments, plunge pools, separate areas for men and women as well as steam rooms and saunas. Entertainment onsite includes live music from incredible artists at Rocks Lounge, a bowling alley, a movie theater and couples can relax with a hand crafted libation at Onyx Bar while looking at the surreal scenery of Red Rock Canyon. Romantic dining does not get any better with couples indulging on world class cuisine at Masso Osteria and the steaks at T-Bone will have your mouth watering for more. 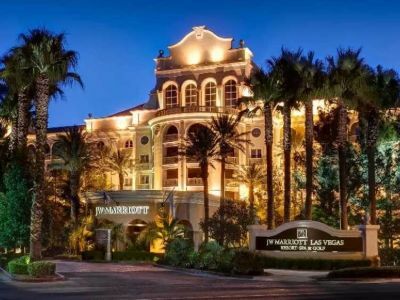 The JW Marriott Las Vegas is a superb romantic hotel in Las Vegas with numerous upgraded amenities for couples like a beautiful spa, a TPC golf course and several stellar restaurants. Located in the Summerlin area west of the Strip, JW Marriott Las Vegas has a Mediterranean architectural style with gorgeous gardens with lots of palm trees and flowers. Rooms and suites have recently been refurbished with sleek upscale interiors that have marble bathrooms, walk-in closets, floor to ceiling windows and a variety of garden views. The onsite Spa Aquae is ideal for couples with numerous treatments, steam rooms, separate lounges and plunge pools. Athletic couples can enjoy a relaxing game of golf on the 18-hole TPC championship style course and the 11,000 square foot swimming pool area contains waterfalls which are surrounded by a lush garden environment. Nighttime entertainment begins at Bonkerz Comedy Club, Addison’s Lounge features local music groups and the Round Bar is an intimate piano bar. Dining at this romantic Las Vegas hotel is superb with teppanyaki-prepared dishes at Shizen Japanese Restaurant and couples can indulge in flavors of Italy at Spiedini Ristorante. Couples who are looking for an upscale romantic hotel in Las Vegas that boasts an excellent spa, freshwater pool and lots of added amenities should stay at Palms Place. Located a short distance from the Strip, Palms Place has a sleek modern architectural style that features a contemporary upscale decor which includes custom-designed furniture and lots of polished chrome. Rooms and suites have gorgeous views with floor to ceiling windows, spa tubs and large bathrooms. The hotel has special items that romantic couples are interested in such as the Drift Spa with plunge pools, saunas and 20 treatment rooms as well as the first hammam in Sin City to help rejuvenate your bodies. The 50,000 square foot rooftop pool area is superb with unique daybeds, waterfalls and lots of tropical flowers. Entertainment at this romantic Las Vegas hotel starts at the Pearl Theater where you can view top notch musical groups and the Studio at the Palms is ideal for couples looking to explore their own musical talents. Also onsite is a movie theater, the Rojo Lounge for hand crafted cocktails and rooftop Apex Social Club is situated on the 55th floor with enormous views of the Strip. Dining is ideal with perfectly grilled meats at the Scotch 80 Prime, delicious Italian cuisine at Vetri Cucina and Bobby Flay brings seafood to life at Shark. Green Valley Ranch Resort and Spa is an expansive complex which brings a taste of the Mediterranean to guests and is one of the more romantic hotels in Las Vegas. 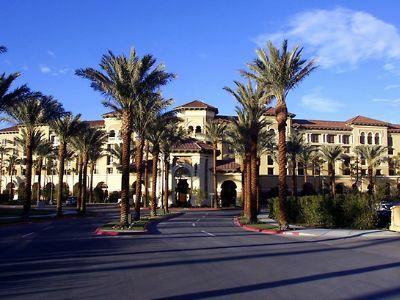 Located 11 miles from the Strip in Henderson, the Green Valley Ranch Resort and Spa offers a unique environment for couples who are looking for a relaxing and romantic time with plenty of amenities onsite. Rooms and suites are luxurious with a European flare that includes upscale furnishing such as soaking tubs, patios with French doors as well as upgraded features in suites like whirlpool tubs, pianos or pool tables. The complex is wonderful with an eight acre garden packed with swimming pools surrounded by adult-only cabanas and swaying palm trees. There is a nice spa to help couples relax and rejuvenate their bodies before or after an exciting day at the resort. This romantic Las Vegas hotel has lots of entertainment for couples which includes DJs at the Drop Bar and there are a number of tribute style concerts to musical groups from Sir Elton John to Journey to Queen. Romantic dining can be found at Hank’s Fine Steaks & Martinis which offers a plush interior with perfectly grilled cuts of meat. Other casual dining options for couples include a stellar buffet, Italian at Bottiglia and Mexican dishes at Borracha. 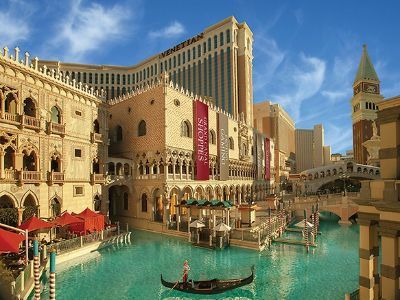 Couples looking for a romantic hotel in Las Vegas that brings the romance of Venice, Italy to Sin City should try the Venetian. Located along the Strip, the Venetian boasts a tremendous amount of romantic fun for couples from gondola rides to street buskers to incredible dining options. The 36 story building features a modern architectural style with a stunning interior that brings the sights and sounds of Venice to life. Rooms and suites are spacious with unique furnishings from sunken living rooms with plush furniture and most accommodations sport big views of the Strip. One of the nicest features at the Venetian is the 134,000-square foot Canyon Spa which offers 90 treatment rooms, a 40-foot climbing wall, saunas, steam rooms and the signature Aquavena Thermal Suite is the only one in Las Vegas. This romantic Las Vegas hotel has a great atmosphere with fabulous shopping at the Grand Canal Shoppes which are set on a quaint Italian style street complete with street performers singing opera. Couples will relish the idea of taking a romantic gondola ride with their own gondolier belting out love songs as they view the incredible sights of the stunning interior of the hotel. Dining is another perfect idea for romantic couples with the French style bistro Bouchon, Mott 32 features intriguing Asian dishes and Wolfgang Puck grills up monster steaks at the CUT. The Wynn Las Vegas is one of the more romantic hotels in Las Vegas for couples looking for superb amenities, comfortable rooms with big views and excellent onsite dining options. 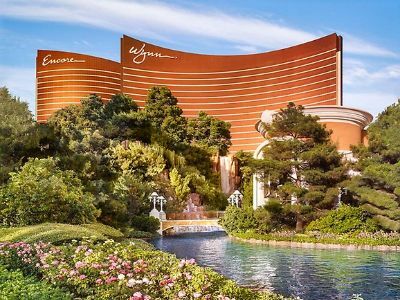 Located along the Strip directly across from the Fashion Mall, the luxurious 5-star Wynn Las Vegas is situated on 215 acres of lush manicured grounds which includes an 18-hole golf course and numerous spas that are waiting to pamper you as well as your loved one. The resort has a modern architectural style with rooms sized at 614 square feet and suites as well as villas with up to 8,900 square feet. Every accommodation is spectacular with an elegant interior that includes plenty of space to lounge, floor to ceiling windows and large bathrooms that are ideal for couples. Romantic amenities include a fabulous spa with plunge pools, hundreds of treatments and a sauna in a comfortable atmosphere. SoulCycle within the Wynn is a great place for meditating and working on your mind and body. Dining options are incredible with nine fine dining restaurants including Lakeside next to the Lake of Dreams, Mizumi cooks up Japanese fare and Wing Lei boasts a one-star Michelin rating. 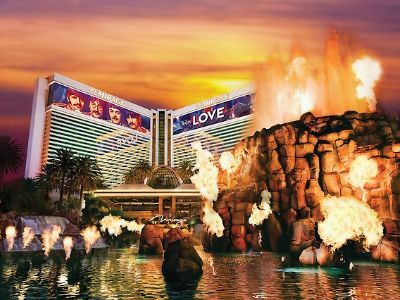 Entertainment at this romantic Las Vegas hotel includes Le Reve by Cirque du Soleil as well as numerous artists like Dianna Ross and there are laser shows at the Lake of Dreams every half hour that are simply superb for romantic couples while dining or having a cocktail. Couples seeking a romantic hotel in Las Vegas will be thrilled with the Polynesian themed interior and surroundings at the Mirage Las Vegas. Located along the Strip, the Mirage has a spectacular atrium filled with palm trees, rainforest fauna as well as waterfalls and fountains. 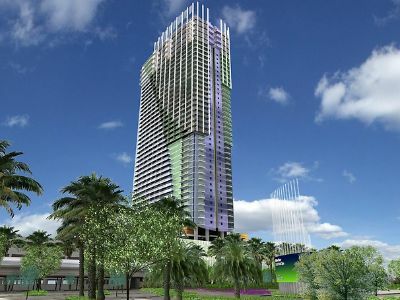 The 29 story building has a modern architectural style with 3,044 rooms and suites that range in size from 394 to 1,600 square feet. Each unit has a modern decor that features plenty of amenities for couples like spa tubs and you will especially like the rooms with a view of the famous volcano that erupts three times nightly. The onsite spa is perfect for pampering before or after a nice night in Sin City and has numerous whirlpools, saunas, treatment rooms, steam rooms and a plunge pool. Fine dining at this romantic Las Vegas hotel is ideal with Otoro serving a variety of shared grilled plates, the Osteria Costa preparing coastal Italian cuisine and Tom Colicchio’s Heritage Steak grills up a perfect romantic meal. Besides the romantic volcano, couples can enjoy fantastic shows by Cirque du Soleil like LOVE-The Beatles and you will thrilled with taking some time to visit the Secret Garden and Dolphin Habitat where you can watch the dolphins. The Four Seasons Las Vegas is a splendid non-gaming romantic hotel in Las Vegas that boasts a unique style of decor, incredible views from the rooms and unlimited entertainment as well as romance. Located along the Strip, the Four Seasons Las Vegas does not offer a casino and boasts a tranquil atmosphere that is ideal for couples. Rooms and suites are simply gorgeous with plenty of living space, floor to ceiling windows, marble bathrooms, butler service and excellent Art Deco style interiors that bring romance to the forefront of your vacation. The spa is another reason to stay at the hotel with hundreds of treatments available for both men and women in a relaxed setting that is perfect for rejuvenating your bodies. Entertainment at this romantic Las Vegas hotel includes VIP access to numerous shows on the Strip, the lush garden area surrounding the pool is truly magical for couples and guests have direct access to the fabulous swimming pools located at Mandalay Bay Resort and Casino which is right next door. Dining is stellar for romantic couples where you can indulge great grilled steaks at Charlie Palmer Steak and exquisite Italian cuisine at Veranda. Couples can finish their romantic night off with a night cap at the Press which offers hand crafted cocktails.